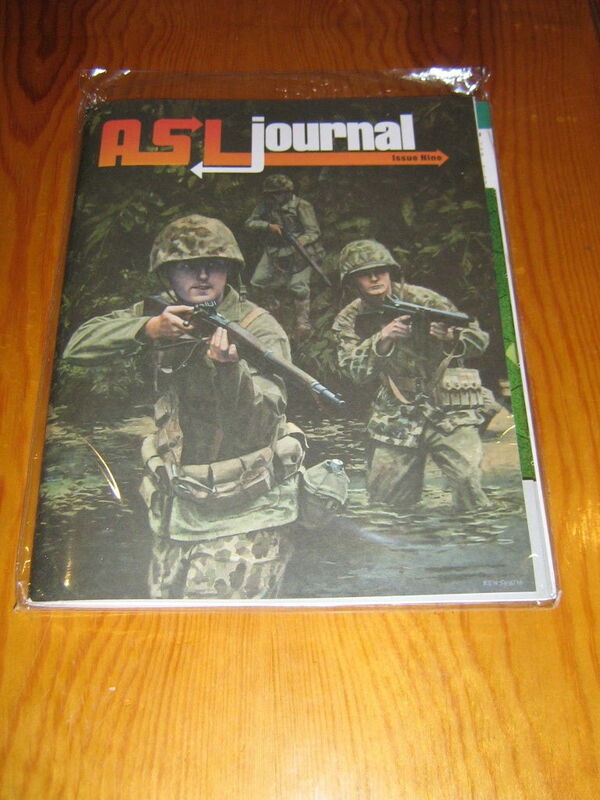 Fans of the ASL Journal had to wait years between Issue Seven and Issue Eight, and when the latter finally came out, it was a bare-bones issue, with articles and scenarios only, devoid of any “goodies” such as maps, counters, or play aids. Luckily, the wait between Journal Eight and Journal Nine (J9) has been refreshingly brief, and J9 comes loaded. Journal fans should be pleased. As of 2014, the ASL Journal is the only place in the ASL world where one can get reasonably good and well-edited ASL writing. After the Journal, the quality level drops off precipitously and the quantity drops almost as much. Many ASL players couldn’t care less about written content, but for others, reading articles about a game they love is sheer pleasure. For those players–which includes this writer–getting a new Journal is always a welcome experience. One could only wish that there were more people who combine the writing ability, playing skills, and ability to communicate game concepts that is necessary for a good ASL article, so that there were even more articles. Journal #9 is a hefty issue, but much of that heft comes from the amazing 24 scenarios (see below) included, as well as a few pages devoted to background or linking concepts. The longest article is a tactics article by Mark Pitcavage on defending key buildings. A shorter gameplay article is “The Art of the Banzai,” by veteran ASLer Bret Hildebran, which talks about some of the intricacies of the Banzai Charge in ASL. It’s a good article, but it could have been even longer (it is only two pages long). 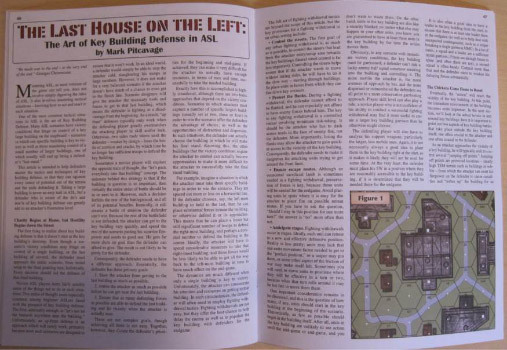 Accompanying it is a second article by Jim Bishop which is an extended example of play to help players understand exactly how the mechanics of the Banzai Charge play out in practice. A useful rules article is “Getting Your Feet Wet,” by Jon Neall, which goes through the rules for water obstacles and devices used to traverse such obstacles, such as boats, amphibians and landing craft. Tim Hunsdorfer provides a short rules article on Panzerfausts. Lastly, Pete Shelling provides some tips on scenario design. The big “goodie” in J9 is “Suicide Creek,” a mini-HASL in the spirit of Primosole Bridge in Journal Six. This HASL represents some of the actions of the 1st Marine Division after its landings at Cape Gloucester on the island of New Britain in late 1943 and early 1944. This action was part of the Allied attempt to isolate the main Japanese base in the Southwest Pacific at Rabaul, on the other end of the island. The Cape Gloucester invasion ended being of dubious strategic value but, at the ASL level, contained a number of interesting actions, including the fighting for the so-called Suicide Creek in early 1944. 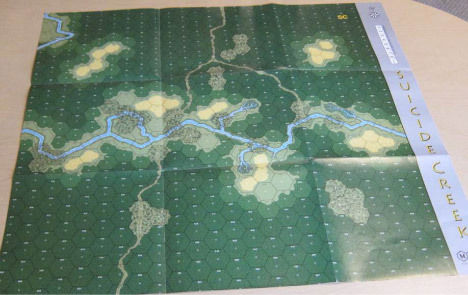 The Suicide Creek HASL, designed by Darrell Andersen, is based on a 24″ x 26″ historical map of the creek, the trail that crossed it, and its environs. The map itself is actually only 21 hexes by 24 hexes in area (basically a tad larger than two geomorphic maps), but the hexes themselves are huge, far larger than hexes in any other HASL. It’s not exactly clear why the hexes are so very large. Some players will undoubtedly like the large hexes, while others will wonder why the map was not a more manageable size; it is a matter of taste, mostly. Unfortunately, the map is printed on glossy paper, which often creates glare and also sometimes has durability problems. It would be nice if MMP would stop using glossy paper for its ASL maps. The accompanying countersheet includes 20 “Corduroy Road” counters, 18 “Pillbox Cellar” counters, a handful of vehicles and guns, as well as a variety of American and Japanese MMC, SMC, and SW. A lot of these are simply duplicates of existing counters (such as 20 more 6-6-8 USMC counters or 8 more U.S. MMG counters) and are not really necessary. 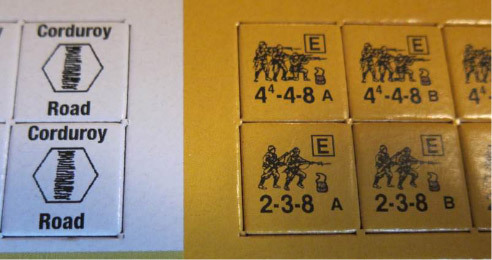 There are some USMC 7-6-8 squads and half squads, and some Japanese 4-4-8 squads and half squads, which are marked with DC icons on the counters to portray assault engineers. The Suicide Creek HASL rules pages provide rules for Pillboxes with “cellars,” allowing occupants to, in effect, skulk in place. They also describe Jungle Debris, which is sort of a cross between Debris and Dense Jungle, and Corduroy Roads (which are like trailbreaks that vehicles can use). Other features include bulldozer-created Fords, American Trip Wires, and American Supply Dumps (which can explode!). 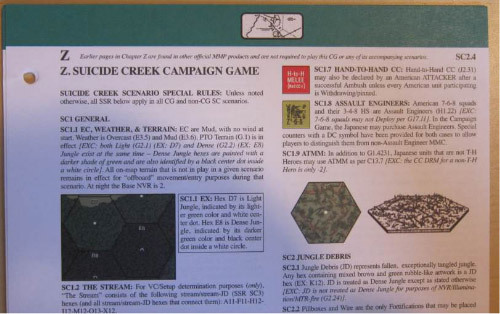 It really only takes about two pages to lay out the basic Suicide Creek rules. The rest of the Chapter Z pages are basically standard Campaign Game rules. The Suicide Creek campaign game, The Green Inferno, is a 7-date CG (each date represents about a third of a 24-hour day). It’s a nice, reasonable sized campaign game, but requires a veteran, cagey Japanese player. Suicide Creek also provides 6 of the scenarios in the Journal, most of which use just a small part of the map. These scenarios tend to be small, and many of them could easily be played at tournaments. Most of them have few SSRs, other than the standard Suicide Creek rules. 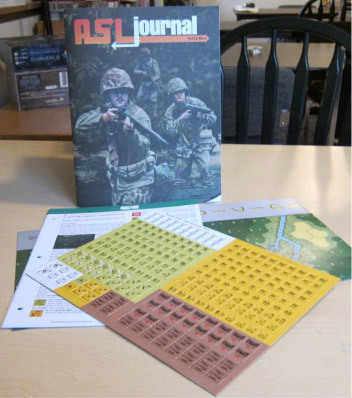 J131 (First Love) takes place in a tiny 8-hex by 10-hex box and features a company sized USMC assault (with 60mm OBA) against a tiny (4 squads, 3 crews) but fortified and very well armed Japanese position. J132 (Jungle Infiltration) depicts a Japanese counterattack, with 6 Japanese squads attacking 5.5 USMC defenders. The USMC can draw upon some potent optional reinforcements (2 6-6-8 squads, a 10-3 leader, and an MMG), but only at the cost of VP. The Japanese are aided by random “Bypassed Units,” which appear based on the position of the American sniper; these can sometimes be substantial. If the USMC player is unlucky, a Japanese unit could basically fall from the sky onto one of his units. The Japanese win immediately if they can amass 11 VP, which are accrued through CVP, the American reinforcement option, and destroying an American supply dump. It looks like an interesting scenario. J133 (One Miserable Night) is a more significant Japanese night counterattack. They have 14 varied squads, well-led, with 2 DCs, and are aided by a limited pre-game bombardment. The USMC heavily outnumber the Japanese in both squads and firepower, though only some of their units are forward, which means their ability to react (because of No Move counters) will be somewhat hindered. The Japanese win immediately if they get 19 CVP (which includes 5 CVP for each of 2 supply dumps, if destroyed), which certainly gives them a reason to hit the forward USMC as hard as they possibly can. It also makes the American supply dumps, as well as their two tanks, targets for the Japanese, because of their high CVP value. This is a scenario in which even a victorious Japanese force is likely to look as if it had been totally destroyed. 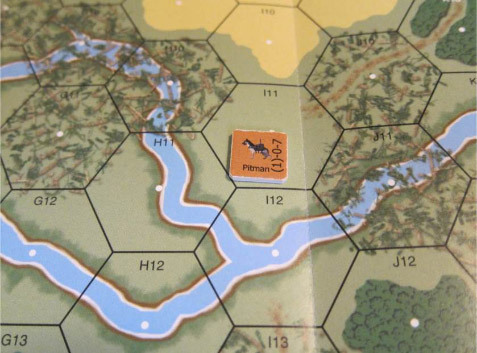 J134 (Kerry’s Crossing) is a smallish scenario depicting a USMC attempt to get an AFV across Suicide Creek. Fans of bulldozers will like this one. J135 (Diversion) is a tiny scenario featuring 8 USMC squads trying to push a quintet of Japanese squads away from the stream. The last scenario, J136 (Muddy Mayhem), is the largest, and the only one which uses the entire map area. Though only 5.5 turns long, it is still pretty meaty. It represents a major USMC attack to get across Suicide Creek. The USMC have 24 squads (including 4 7-6-8 assault engineer squads), 2 guns, tons of SW (including one FT), 6 AFVs, and a module of 60mm OBA. The Japanese defenders have 16 squads, 7 crews, 10 MG, 2 knee mortars, 5 DCs, 2 Guns, and 90mm OBA. They also get 10 bunkers and 6 Wire counters. It looks like it could be a very bloody scenario. Overall, the Suicide Creek package looks really nice, with more variety of action than one might expect. The only negative note that one might sound has nothing to do with the quality of the product, but rather merely its subject matter. Suicide Creek is the 7th official PTO HASL or equivalent (after Blood Reef: Tarawa, Gavutu-Tanambogo, Nhpum Ga, Kakazu Ridge, Operation Watchtower, and Hell’s Corner). Of these, fully 5 of them have involved the USMC, even though the tiny USMC was vastly outnumbered by the U.S. Army in the PTO, to say nothing of the British, Australians, Indians, Filipinos, Chinese, Dutch, and other Allied combatants in the region. The focus on the USMC to the near exclusion of all else is both bewildering and somewhat frustrating. So while ASL players can be happy about what appears to be yet another good HASL, perhaps they can also hope that MMP will in the future spend some attention on the rest of the PTO. Three more scenarios in J9 relate to another HASL, Valor of the Guards. No one can complain that designer Tom Morin has not been supporting his Stalingrad baby since its birth; between the Journal and the newsletter Dispatches from the Bunker, he has released 10 more scenarios for fans of the module. The three in Journal 9 are VotG22 (Bark You Dogs! ), VotG23 (Heroes of the Soviet Union), and VotG24 (Raid on Rodimtsev). Another three scenarios, designed by Pete Shelling, can be linked together to form a mini-campaign of sorts over the fighting for the German city of Nuremberg in April 1945 between parts of the American 7th Army and the German 1st Army. These three scenarios, J143 (Circle of Doom), J144 (Three for the Third), and J145 (Golden Pheasants), are all medium-to-large combined arms actions, typically with lots of AFVs. One of them, J144, has Air Support. Two Journal pages are devoted to the mini-campaign that links the three scenarios. If playing the campaign, players can choose from among additional reinforcements to add to their forces in the scenarios. Of course, the scenarios can all be played independently as well. The remaining 12 scenarios are a mix of actions, including Belgium 1940 (French/British vs. Germans), Eritrea 1940 (British vs. Italian), Malaya 1942 (British vs. Japanese), Soviet Union 1942 (two scenarios: Soviets vs. Romanians/Germans; Soviets vs. Italians), France 1944 (two scenarios, both British vs. Germans), Belgium 1944 (two scenarios: British/Belgian Partisans vs. Germans; Americans vs. Germans), Holland 1944 (British vs. Germans), Hungary 1944 (Soviets vs. Germans), and Germany 1945 (Soviets vs. Germans). Of these, only about two are small, while the remainder are equally divided between medium-sized and large scenarios. One of these scenarios has Air Support; two scenarios have OBA; none of them use Night rules. Four of them use recently released boards. A lot of them have potential. This includes the two scenarios with Italian forces. The first, J127 (Messervy’s Men), is a rare scenario set in Eritrea (i.e. Italian East Africa); moreover, it does not use the Desert rules. In this scenario, the British are on the attack; they have 13.5 2nd line squads, supported by carriers and armored cars. The defending Italians have 12 1st line squads, a Gun, and a light AFV. The British, while not exceeding a CVP cap, must clear the Italians from their hill positions. The second scenario is J130 (The Art of Dying), an East Front scenario. Here, the Italians are on the attack. They have 14 elite and 1st line squads, well armed, accompanied by 5 light tanks; they must capture buildings and Guns from a defending Soviet force of 15 varied squads, including two commissars, with 2 Guns and 2 AFVs. The Soviet forces, however, are split up between a small, not very good on-board force, and a larger, better set of reinforcements, who must cross a lot of open ground to help “rescue” their comrades. The Italians have an overwhelming force at first, but don’t have much protection for it (low TEM) and may see it degrade over time. Their quintet of light tanks is perhaps their most important weapon, as they can serve a variety of purposes and, if they can avoid the Soviet Guns, are not too vulnerable to MG and ATR fire. It is a scenario in which both sides may well have the chance to attack and defend. It is fun and well-balanced and is on its way to becoming a classic. Another scenario, J128 (Opium Hill), is a quick playing PTO scenario featuring a smallish Japanese combined arms attack against a slightly larger, but low ELR, British force. The Japanese get exit VP and some building control VP. East Front fans may flock to J129 (Mountain Hunters), a large scenario on board 2a that features a massive Romanian attack (18 squads, all of them elite), well led, loaded with SW, and supported by a Gun and two German StuGs (complete with two armor leaders). Defending against this horde are 13 mixed Soviet squads, with two commissars (including an 8+1 commissar from Valor of the Guards), and a bunch of their own SW. They also have three Guns. To win, the Romanians have to achieve any 2 of 3 objectives, including controlling two key buildings, controlling a village, or controlling high ground. It’s a lot of action in a small space. Heavy metal fans may like J141 (Riding with the King), another East Front scenario, depicting a massive Soviet attack (including 20 squads and 9 AFVs, including 4 IS-2s) against a small but elite German force of 11 squads and 2 Guns, reinforced soon enough by 4 AFVs that include 2 King Tigers. Ouch. One scenario that might end up seeing a fair amount of tournament play, if it proves balanced, is the Ian Daglish-designed J137 (No Mercy in Burcy), which features a German force of 12 8-3-8 squads, loaded with good leaders, MGs, and flamethrowers, as well as a few halftracks, which can win immediately by exiting a bunch of VP off the edge of the board, or by controlling 2 stone buildings by game end. The defending British have 10 squads, 5 Shermans, and some OBA to stop them. A larger Daglish scenario is J138 (Point to Make), also featuring British and Germans, only this time the British are on the attack. They have to take a factory while keeping within a casualty cap. Both sides get to make some choices (of different types) about their OBs. Another interesting British-German scenario, designed by Richard Weiley, is J140 (All Down the Line), a short and simple tournament-sized scenario featuring a small but elite British paratrooper force trying to get past (and exit) a motley collection of German defenders. It is balanced and fun. Lastly, it is worth mentioning J146 (Ragnarök), designed by Martin Svärd (who somehow just had to get a Scandinavian word into the title of this Soviet-German scenario!) and set in the waning moments of the Battle for Berlin. It features an attempt by German remnants to escape out of Berlin. They have 10 squads (4 6-5-8 SS, 4 4-4-7, and 2 4-3-6), 3 leaders, and two halftracks to try to get off the board, and possibly achieve immediate victory. Trying to stop them are 7 Soviet squads, reinforced by 2 more, as well as 3 AFVs. The Soviets also get 7 special concealment counters that represent possible reinforcements. Under certain circumstances, the Soviet player may get to attempt to activate some of these counters during the course of play. This may result in no effect, or could cause a squad or half squad to appear. Neither player will know what may or may not be there until the event is resolved. 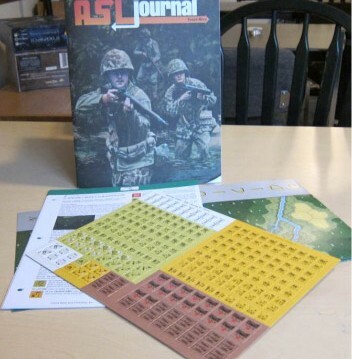 As one can see, there is a tremendous wealth of play value in this product, with HASL action, mini-campaign games, Valor of the Guards goodies, and scenarios of all sizes and theaters. Every single scenario is designed by a veteran scenario designer, and some of ASL’s best designers are represented here. When the article content is added to all this juicy goodness, well, how can one resist? It’s a solid product. Is that a mine dog named Pitman? Where does it come from and how do I get one?